is also the first by Team Canada in a doubles event. UK Carrom Federation invites all carrom players to participate in the final carrom league & competition 2012-2013. The league will be on Sunday, 28th April 2013 from 2:00pm. 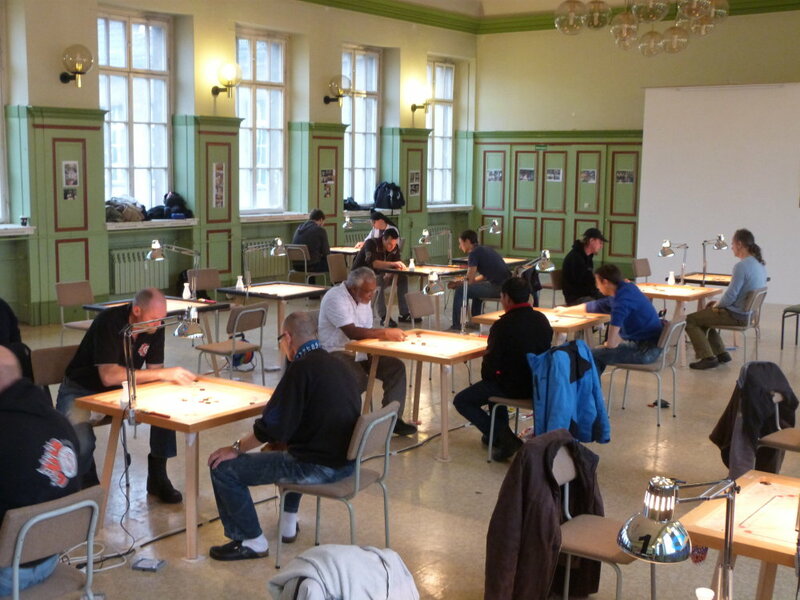 This is the 5th league of the year 12/13 and the top 4 players will be ranked to participate in the UK Team Event in the next Euro Cup 2013 in Poland. Please make sure you arrive on time and respond to this email to confirm your attendance by 27th April, Saturday the latest. https://www.facebook.com/UKCarromFederation For all other enquirers please email to info@ukcarromfed.com or contact on 07900196461 or 07958335557. Entry fee of £10 to be paid on the day before 2pm. New Delhi : Shri Pranab Kumar Mukherjee, Hon’ble President of India was greeted by Shri Prabhjeet Singh Bachher, General Secretary, All India Carrom Federation on his birth day party held at Rashtrapati Bhavan. Shri M. Sharan, Asstt. Secretary accompanied him. During his very brief meeting he conveyed him that the Indian Carrom team brought laurels of victory in the 6th World Carrom Championship with winning 6 Gold, 3 Silver and 3 Bronze Medals and Mrs. Rashmi Kumari from India became World Champion. Bihar Girls team own team championship title whereas Boys team were placed third at the 40th Sub Junior National and Inter State Carrom Championship held at Salt lake, Kolkata on concluding day of the championship. Nisha of Champaran (Bihar) own girls singles title and gave Bihar a new year gift. Bihar Girls team defeated chandigarh by2-1, in which Nisha of Bihar beat Manu Gupta of Chandigarh in straight set 18-7& 9-4.Tuba of Chandigarh equalized by beating Neha of Bihar by 14-3 &13-9.The deciding match was won by doubles pair of Rinki and Kajal of BIhar against NIdhi and Sanya of Chandigarh by 15-10 &19-2 and claimed the title. Bihar Boy's team lost in semi final to U.P but fought back to beat Vidarbha by 2-1 to claim the third position,Aquib &Wasim of Bihar won their single match against Vidarbha. In the Girl's Singles event Nisha of Bihar displayed splendid game against Tuba of Chandigarh and won by the score of 9-20,13-7 and 14-11.However Neha of Bihar lost in the semifinal and was placed at 4th place. Rashmi Kumari of Bihar playing for Petroleum Sports Control Board beat P.Nirmala of LIC of India to own Women's singles title of 20th all India federation cup Carrom tournament played along with sub junior national. Gen sec. Bihar StateCarrom assn. ,Patna. I attach herewith results of Inter-Zonal National Carrom Championship organised by All India Carrom Federation and hosted by Union Territory Pondicherry Carrom Association from 30th November to 2nd December 2012. It is a National Ranking Championship having a bearing on the selection of Indian Team. The results are very interesting and Men Singles event was a repeat of World Championship. A young boy hailing from Moradabad city of U.P. in India, Mohd Gufran defeated Prakash Gaikwad 25-18, 25-16 in Quarter-final, C. Bharathidasan by 25-15, 25-12 in Semi-final and Yogesh Pardeshi by 25-11, 25-14 in final. He was outstanding and displayed highest level of skill and surprised all players with his thrilling and exciting finishes. The All India Carrom Federation has distributed the whole country in six zones for carrom purposes - North, East, West, South, North East and Institution. Institution Zone is not a geographical zone. Since players belonging to State Associations can only participate in five zonal championshis, a special zone was created to have the representation from affiliated Institutions. 30 State Associations field their selected teams in their respective zones. Six men and six women players were selected from each zone on the basis of their performance in five zonal championships and one Institution National Championship. Those 12 players from each of the six zones participated in the Inter Zonal National Carrom Championship. Mr. S. Udaya Kumar was the Organising Secretary and as a host they provided completely free boarding, lodging, transport and wonderful trophies to all participants for four days. The Institution National Carrom Championship along with a carrom tournament for Blinds was organised in one of the Shopping Malls with high foot fall situated at prime location in Gurgaon, part of National Capital Region of Delhi. I shall be sending the report, results and photos of this event separately. The All India Carrom Federation is organising two major events together i.e. Sub-Junior National & Inter-State Carrom Championship (for boys and girls under 14 years and 12 years of age) and All India Federation Cup Carrom Tournament (A National Ranking Tournament for senior players) from 25th to 30th December 2012 at Kolkata, West Bengal. Both the events will be played together on 64 boards for six days. The host i.e. Carrom (29") Association of Bengal will be providing completely free hospitality to about 700 participants from 30 State Associations and 17 Institutions. I am happy to inform you that due to vidorous efforts made by President and General Secretary of All India Carrom Federation Carrom has been included in the activities of School Games Federtion of India. This will spread the game as competitive levels in more than 2 lacs school affiliated to all State Governments of India. Chhattisgarh Government has kindly accepted to host the next National of SGFI at Raipur (Chhattisgarh) in India. This big achievements of All India Carrom Federation after the inclusion of Sports activities in 7000 Schools affiliated to CBSE Schools. The efforts for bringing the game of Carrom in Future prospects should be commended and noted by the International Federation. International Carrom Federation may note that an International School Boys Tournament/Competition is also held and ICF may try to get this game included in this event also. Every affiliated Nation should also try to get the Carrom included in Schools' Competition in their country. AICF is confident that this step will lead the game spread in Millions children of India. During the interesitng Carrom Championship in Warsaw on 21.05.2011 the FIRST WHITE SLAM OF POLAND was scored by Sylwester Pogorzelski. The Championship was won by Cornel D'Silva from Polish city Łódź who defeated Nithesh Singha in final. Chandigarh, May 2011 on the concluding day of 11th North Zone Carrom Championship 2011 here at St. Stephen School, Chandigarh. Mohd. Zahid (Delhi) bt. 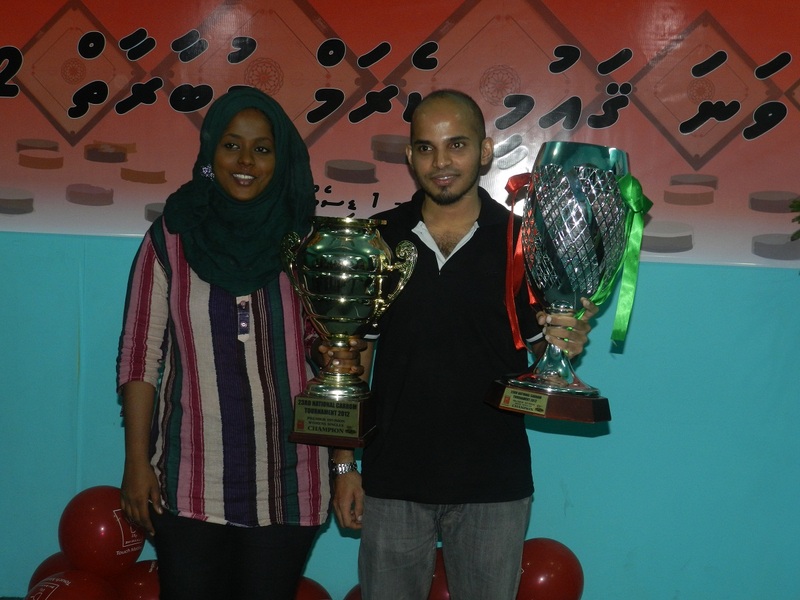 Jameel Ahmed(Delhi) -17-8, 25-00 in the Men singles title of the North Zone Carrom Championship beating his team mate in the keenly contested Final Match. In Women Singles also the fight for top position was between players of Chandigarh namely Farheen bt. Tuba – 25-4, 17-13. In Boys Singles Final: Mohd. Arish (Chd) bt. Ankit (Har)-21-07, 21-11. Shri S.K. Sharma, Secretary General, International Carrom Federation and Shri Kuldeep Singh, a famous architect of Chandigarh graced the occasion as Guest of Honour. While giving the prizes to the winners the Global head of this game Shri Sharma gave some important information about the game of carrom – Indian Carrom Team is participating in the 15th SAARC Countries Carrom Championship and the 4th Asian Carrom Championship being held in Maldives from 28th May to 4th june 2011. He said that Indian players who are world champions would once again lift all the titles of both the championships. He also stated that CBSE has included the game of carrom in their sports activity calendar and stated that it is also being recognized by School Games Federation of india and kendriya Vidyalaya. He has also appreciated the performance of players of Delhi, Chandigarh and Haryana and gave his good wishes to the North Zone Carrom Team for Inter Zonal Carrom Championship being organized at Guntur (AP) in July 2011. Shri Mahesh Sekhri, Organising Secretary of the Championship gave a detailed report of the Championship and expressed thanks on behalf of CCA to the School management of St. Stephen School for their support in organizing the event and all others who have extended their support directly or indirectly in organizing the event. During the Closing Ceremony the national champions from Chandigarh namely Farheen, Tuba, Mohd. Hassan and Mohd. Talib were awarded cash prize of Rs. 5001/- each by the St. Stephen School Chandigarh. Carrom is officially allowed in Inter School Sports & Games Competitions in 7000 Schools in India and Indian schools in Bahrain, Dubai etc. This will enable us to streamline students of 7000 Schools in India and abroad ie. Baharin, Dubai and other countries to enter.You may congratulate our President and General Secretary for this achievemdents. I amy recall that this was initiated during your last visit. Sir kindly send us the list of affiliated National Carrom Federations affiliated to International Federation so that I can be able to transmit the information to the Government. In Men Doubles event, defending champion pair from India, Yogesh Pardeshi & B. Radhakrishnan defeated their traditional rivals from Sri Lanka, Chamil Cooray and Nishant Fernando 25-11, 25-14. Third position was claimed by Bangladesh pair of Mohd Ali & Hafizur Rahmandefeating Maldives pair of Neesham and Hamid 25-24, 9-25, 25-24. Indian pair of I. Ilavazhaki and Rashmi Kumari, who was defending champion, won Women Doubles title when they defeated Sri Lankan pair of Roshita and Chalani 25-5, 25-4. Aishath Fainaz & Vishama of Maldives secured third position. Indian Team was congratulated by Indian cricketers Sachin Tendulkar, M.S. Dhoni, Virender Sehwagand Rahul Dravid who were present in Colombo for the Indo-Sri Lanka Cricket Test Series.